Gerardo Bruna celebrates after his stunning free-kick found the back of the Pat's net. ARGENTINIAN midfielder, Gerardo Bruna netted the pick of the goals in Inchicore as Derry City moved into second spot in the SSE Airtricity Premier Division. It was a fourth win on the bounce for Declan Devine's troops as they put 10 man Saints to the sword during an impressive first half. Patrick McClean made an instant impact on his return to the starting XI with an excellent strike to give City the lead on two minutes. It was McClean's second goal for the club and his first since his blistering strike in Longford three years ago! The man dubbed 'the Madrid Messi', Bruna then doubled City's lead with a sublime free-kick on 18 minutes - his second goal in just his third start for the club. St Pat's defender was shown a straight red card moments later for a reckless challenge on Ciaron Harkin. Gerardo Bruna's superb free-kick finds its way into the bottom corner despite the best attentions of Brendan Clarke. Junior Ogedi-Uzokwe added a third for Derry on the half hour mark before Gary Shaw gave the home side a lifeline with a headed effort two minutes later. 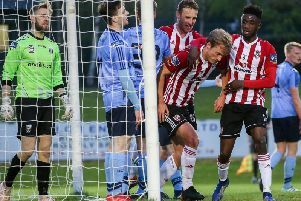 Derry did enough to keep St Pat's scoreless in the second half and clinch a result which moves them above Bohemians into second ahead of Friday's visit of leaders Shamrock Rovers to Brandywell. It was a far cry from the club's last visit to Richmond Park on the final day of the 2018 season when they capitulated in a 5-0 drubbing and a hugely encouraging result as they made it two wins from two trips to Dublin in the space of four days. Devine made three changes to the team which won at UCD four days previously. 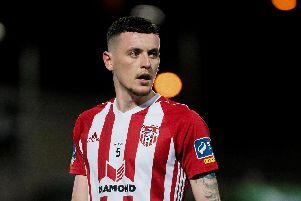 Skipper, Barry McNamee, Ciaran Coll and Eoin Toal were replaced by Bruna, McClean and Josh Kerr as the City boss freshened his side up. Derry City's Patrick McClean celebrates putting his side into an early lead. And Devine couldn't have planned a better start to the match as Sloggett drove forward before cutting the ball back to McClean who took a touch before drilling the ball into the far corner of the net with two minutes. Derry were controlling the ball in the early stages but St Pat's found themselves in a promising scoring position on 15 minutes. Darren Cole was fouled by Jamie Lennon as he raced towards goal on 18 minutes., Up stepped Bruna to take the resultant free-kick from 25 yards and he curled his sublime effort over the wall and into the bottom corner. Kevin Toner sees red for his challenge on Ciaron Harkin. Within 60 seconds the Saints were reduced to 10 men following a crunching tackle from Toner on Harkin in the middle of the pitch. Referee, Paul McLaughlin was well positioned and flashed a straight red. It was the second match in succession the Saints were at a numerical disadvantage but they almost carved a way back into the game when Ian Bermingham let loose with a powerful strike but Cherrie saved smartly. The Candy Stripes added a third on 31 minutes when Darren Cole's dangerous cross from the right fell to Ogedi-Uzokwe who fired in from close range at the back post. Derry appeared to be cruising but Pat's struck back almost immediately as ex-City defender, Simon Madden drove forward on the right wing before finding Shaw with a superb cross. And the big striker raced across to the front post and bravely stooped to head home and give the home side something to hold onto. The Saints were enjoying plenty of the ball at the start of the second half without testing Cherrie. When Harkin found Stokes in space on the edge of the penalty area his shot took a deflection off Parkhouse and went wide of the far post just short of the hour mark. The home side came so close finding the net on 65 minutes when Madden's cross found Shaw but the striker's deft header went the wrong side of the post. Harkin tested Clarke with a decent effort on the volley from the edge of the Pat's penalty area on 74 minutes after great work by Parkhouse and substitute, Barry McNamee. Pat's sub, Jake Walker tried his luck from distance but Cherrie saved to maintain the two goal advantage as Derry secured a fantastic win to move into second. St Pat's: B. Clarke; S. Madden, K. Toner, L. Desmond, I. Bermingham; J. Lennon (D. Clarke 76), D. Markey (J. Walker 80), C. Clifford, R. McCabe (Cian Coleman h-t), C. Kelly; G. Shaw; Subs Not Used - B. Murphy, J. Doona, C. Forrester, P. Cleary.